In this viral video taken Friday, several residents of Pagadian City rushed to an elevated area overlooking the sea where a whirlpool occured. A whirlpool is a swirling body of water produced by the meeting of opposing currents. 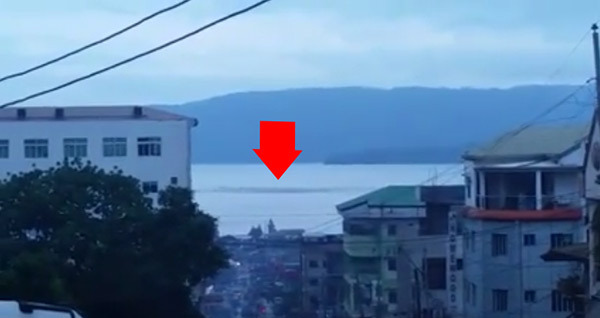 The 1-minute, 3-second clip was posted on Facebook by Destiny Pagadian senior pastor Mervin Ascabano, who believes that what occured was a vortex (a whirlpool that has a downdraft). In his reply to a comment, the uploader said the whirlpool was first seen early morning of August 7 and went on even after he took the video. The cause of its occurence is still unknown since no earthquake struck that day, the pastor said, adding that the city government has not issued an official statement regarding the whirlpool. In a separate comment, Ascabano said some residents were scared as they have experienced trauma after a tidal wave hit the city in the same month back in 1976. He was referring to the 1976 Moro Gulf earthquake and tsunami which took place on August 17. Pagadian City was among the coastal communities devastated by a massive tsunami that killed at least 5,000 people and left thousands more missing.